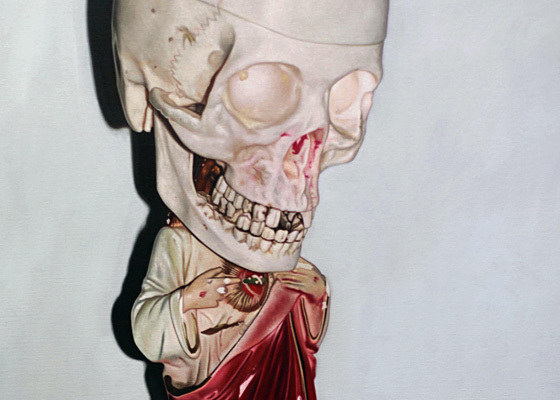 In T.E.A.M Atlas, Lucas Price will exhibit a completely new body of work. The title Team Atlas is an acronym, (The Earth As My Atlas), which refers to the idea of mapping and cataloguing using images and text. The work comprises a series of large scale oil paintings and carbon and graphite drawings which depict every day objects rendered in hyper realist oils, and panels of monochrome texts which draw on a variety of sources, from sculptural forms to skewed sporting logos. Shown together the works create new points of departure. Incorporating poetry, appropriation, trompe l'oeil, photography and sculpture, the show is a manifesto of sorts, which lays the ground work for a series of possible new directions. If the atlas is a big as the earth, the exploration starts where you stand. Price is one of very few artists to be accepted onto the Royal College of Art's MFA painting course without any prior training or qualification. This exhibition will show a culmination of work created during his time spent at the college, building on an artistic path that has led from graffiti, painting the UK's largest illegal piece & being invited to appear in Banksy's Oscar nominated film “Exit through the Gift Shop”, via fashion and design.